LOCATION! 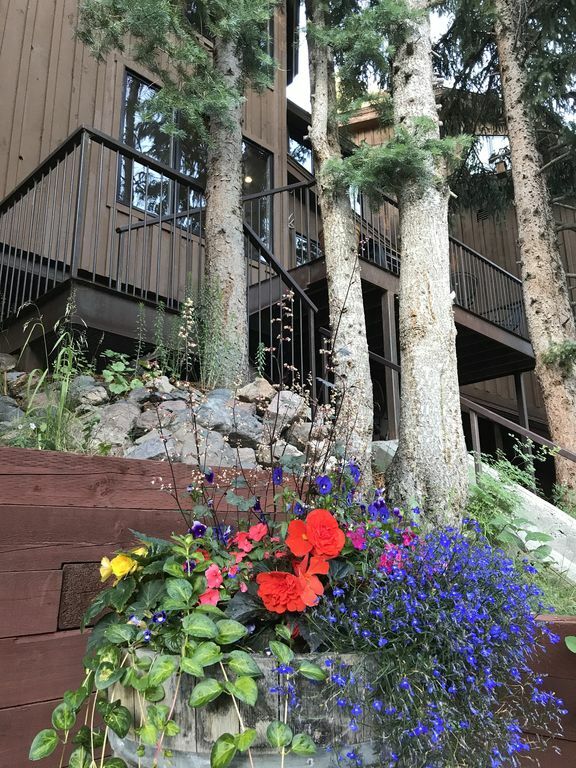 Spacious luxury 3 level, 4 BR townhouse in the Manitou Riverhouse in center of Telluride, Ski in, and less than 100 yards from Chair 8. Incredible quiet location but only 1 block from Ski Gondola (east), two blocks from Town Center (North), and 3 blocks from Town Park (west). Full renovated unit featuring a private entry + ski mudroom. Unique floor plan offering approx 2000 sq feet of living space on the side of the best ski mountain in the world. It is 3 floors, 4 bedrooms (1 of the bedrooms is an open configuration which can be a bedroom (2 twins or King) or additional kids family room). Unit has private outdoor deck and access to hot tub (shared). Main floor features spacious living room, deck, dining room with a gourmet kitchen with commercial range/grill and beautiful woodwork and cabinets. First floor has 1/2 bath. Second floor has 3 bedrooms (BR1 - Queen with private bath, BR2 - Large Room with Bunkbeds and Queen, BR3 - Living Area with a Futon and Daybed (King or 2 twins). These both share a full bath. Third floor MBR with King and great bathroom. All baths are slate and tumbled marble. Radiant heat in all floors. Deck overlooks town, chair 8 and Gondola. 360 views all over the unit. Location, Location and Location! All bedrooms offer views of the ski mountain and/or town. This unit has its own private entrance and mudroom, tree-filled deck area for privacy and was renovated top to bottom. Located in the heart of the historic town center, an easy stroll to restaurants, shopping, hiking trails, Telluride Town Park, and the new Telluride library. Only one block away, the Telluride/Mountain Village gondola provides direct access to all winter and summer activities including skiing, snowboarding, hiking, golfing, and biking. Perfect for 2 families and kids, or 3 couples. Ideal is 8 but could sleep 12. It needs to be well respected and taken care of, it is part of our family! Best summer and winter playground in the world!